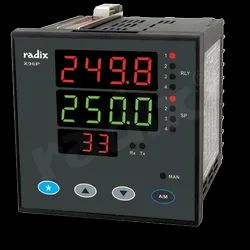 Select from cost-effective and full-featured Radix PID Controllers that accept inputs from RTDs, thermocouples as well as linear inputs such as 4 - 20 mA, 0 - 20 mA, 0 - 50 mV etc. 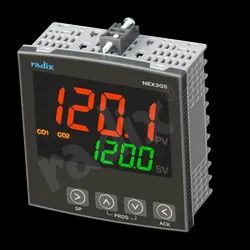 Large LED displays and LED lights on the controller indicate process variables and relay, communication status and are easily visible to operators from a distance. 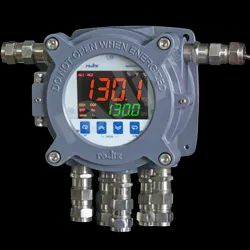 Operators can easily program setpoints, alarms, control outputs on the controller via membrane keys on the front of the unit to trigger heating, cooling, high-low alarms. 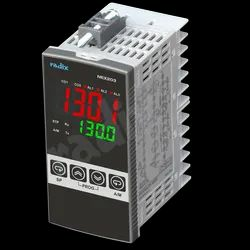 Our PID Controllers broadcast signal isolated outputs to protect all downstream machines and devices (such as programmable logic controllers) from damaging fluctuations in the input signal. Many of these products have a flameproof version as well, which can be found here. 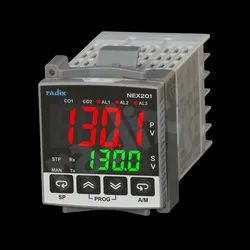 X96 is a full-featured PID controller. It receives 2 universal inputs which can be factory-programmed for either of two groups. Group 1 contains 8 types of thermocouples (B, E, J, K, N, R, S, T), Pt100 RTDs and 0/4-20 mA and 0-50 mV linear inputs. Group 2 contains 11 types of thermocouples (B, C, D, E, G, J, K, N, R, S, T), Pt100 and Cu53 RTDs, 0/4-20 mA and 0-50 mV linear inputs. 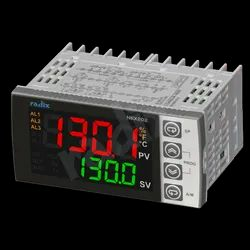 A large LED dual-display on the front of the process controller shows the difference in values of the setpoint and process value while 11 additional LEDs indicate the state of each of the 4 relays, 4 setpoints, Auto/Manual and communication status. Buttons on the front of X96 allow operators to easily set up to 5 setpoints - 4 for the relays as well as one for a 4 - 20 mA signal should they choose to use the linear output for control. With an error of only 0.1% of the full-scale, this is a process controller of superior accuracy. X96's electromagnetic relays trigger heating, cooling or any of 6 types of alarms - full-scale high/low, deviation high/low, inband and outband. It also retransmits an isolated output signal to other devices such as a Programmable Logic Controller (PLC). Signal isolation protects your devices and machines downstream of our instruments from damaging fluctuations in the input signal. X96 is an auto-tuning PID Temperature controller; from cold start or at setpoint. Typical applications are temperature control, RH control, thyristorised heating applications, AHU control in HVAC and BMS applications. 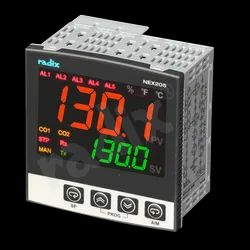 Looking for PID Controller ?